Chances are, if a sudden disaster occurs at your workplace and you are forced to shelter in place for a given time, many coworkers (including yourself) could be unprepared. So, ReadyNutrition Guys and Gals, have you made a big batch of pemmican for yourselves yet? If so, then I commend you. If not, then get on the stick! The beef stick, that is, because pemmican is one of the foods that is perfect to carry around. I know, I know, between bug-out bags, micro-tools, thermoses, and the likes of which I have been writing about recently…you need to be an octopus to be able to carry all of it. It is better to have, as you well know, than not to have something. Let’s talk about food in this regard. Talk to your supervisor about the existing emergency plan and find ways of improving it. You could even create a preparedness month where each coworker donates money to get the office prepped! If your workplace shrugs off your attempts to get them prepped, that shouldn’t stop you from getting some extra food and provisions for yourself in your workplace (and also carry a little on you at all times). Keep in mind, this is about giving yourself an “edge” and perhaps buying you some time in a sticky situation. If you have a workplace locker (the best are those that lock), a basket/cubby space, or a shelf for your things, you can stock up a few cans of food and some essentials. Why? Because that is what preparation is all about: the “what-if’s” that may arise. What if you cannot go outside to your vehicle to get your “go” bag? There could be any number of reasons: severe flooding, rioting, extreme cold weather, among others. You may have to make do with what you have on your person or in your workplace. As well, make sure you have some clean athletic socks and walking shoes stored on you. As well, have some extra change on hand in case you need to get items from the vending machines (items like water, nuts, crackers, etc., will run out quickly in an emergency). That will get you started, but you don’t have to stop there. There are many types of disasters that could occur while you are at work. What happens if there is a fire and you need to escape? Or, in a worst case scenario, hazardous material has leaked into the air. Why not have a gas mask on hand? There are many gas masks that are compact and can fit inside your desk. If it’s a time of trouble or scarcity, whatever you need will also be needed by others. Sesame Street rules aside, you do not need to advertise that you have a stash of extra food in your office drawer or wall locker. Keep your supplies in a nondescript gym bag or other non-transparent/non-translucent carrier. Their need is not a justification for your sharing, nor their shortsightedness for your “help” regarding preparations. 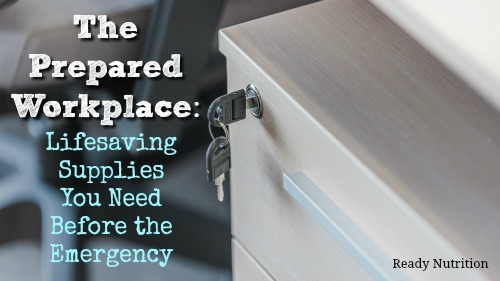 One way to circumvent this is to get coworkers involved in getting the workplace prepared for these types of emergencies and have them create their own personal workplace pantries. So, we’ve addressed the workplace, and now how about on your person? Why? Because it gives you an edge. I have written articles in the past on the value of cargo pants with cargo pockets. Here I am, recommending them again. I carry a small bag of peanut butter-filled pretzels in my cargo pocket, as well as a bag of jerky, and about half a dozen hard candies (I like those Jolly Rancher ones). There’s a good reason for it. What if you’re trapped in an elevator? Or (as mentioned before) something goes wrong, such as a power outage that leaves you trapped for a while. What then? It is a proven fact that the intake of simple sugars helps the human body during times of stress or crisis. In addition, it is a psychological support you’ll give to yourself to help you deal with all of it. The protein in the jerky and the peanut butter is important; the necessity to replace protein can never be understated. The hard candies give you some simple sugar to throw into your bloodstream, and keep the mouth from drying out. As I’ve mentioned in previous articles, if you can’t drink, then do not eat anything. You will deplete yourself further; you must drink in order to digest your food. The difficulty this presents is obvious, because if you don’t tote around a water bottle all the time, you’ll have trouble finding water when the need arises. So, tote it around! Everybody walks around all the time with coffee cups and soda bottles, so it won’t look out of place for you to tote around a 20-ounce PowerAde bottle with water in it. These are akin to “tiers” of response levels: 1st is what you have on you, 2nd in your work area/locker, and 3rd in your vehicle. One more key point: All the stuff not on you becomes a cache point if you can’t reach it, and you can go for the stuff later on. You may have to forgo getting food out of your locked desk drawer because 10 other people may see it. Who’s going to think of going into your desk drawer for food unless you make them aware it’s there. Practice OPSEC, and re-read the article I wrote on the Nosy Neighbors…the ones who will eat your food and maybe you along with it if their needs call for it. Keep it to yourself. It’s better to wait until everybody is out of the area, and then obtain your supplies from your locked and unknown (to your “buddies” at work) location. Ounce of prevention, pound of cure. JJ out! In my agency, I was able to get the approval and issuance of a “Go Bag” for the employees in my section. Got them from Ready Made Resources and they’ve been a big hit.